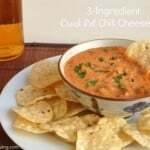 Here’s another super simple recipe perfect for snacking on during Sunday’s Big Game or for your next potluck: Super Simple Crock Pot Chili Cheese Dip. Potluck’s and Sunday football games are both excuses opportunities to indulge in all kinds of fun foods that I rarely eat these days: chicken wings, cocktail sausages, Chex party mix and cheesy dips like this crock pot chili cheese dip. 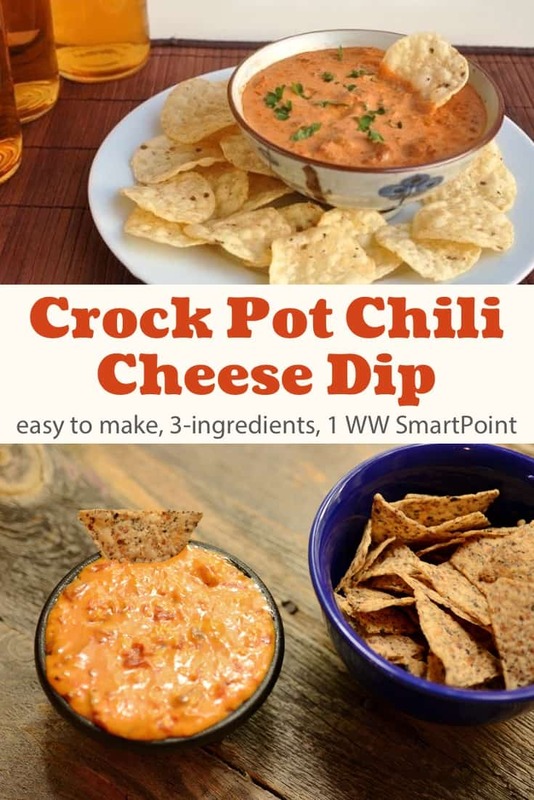 I adapted the recipe for this 3-ingredient chili cheese dip from Fix-It and Forget-It Lightly Revised and Updated: 600 Healthy, Low-Fat Recipes for Your Slow Cooker (affiliate link), one of my favorite cookbooks for easy, practical Weight Watchers friendly crock pot recipes. As written, the recipe called for sauteed onion and garlic salt, two ingredients that seemed totally unnecessary, so I skipped them. Tasty and not as thick as some chili cheese dips, I thought it was yummy and ended up having it for dinner last night. Rod thought it was okay, not great, and opted for leftover Slow Cooker Ham and Wild Rice Soup instead. According to my calculations, each 1/3-cup serving has about 92 calories, *2 Weight Watchers PointsPlus, *1 WW Freestyle SmartPoint. Enjoy! If you’ve made this chili cheese dip, please give the recipe a star rating below and leave a comment letting me know how you liked it. This easy crock pot chili cheese dip - made lighter with only 3 ingredients - is a crowd pleaser and perfect for game day get togethers and potlucks! Place the cream cheese, chili and salsa in the slow cooker. Stir to combine. Cover and cook on LOW for 2 to 3 hours, stirring occasionally, until hot. 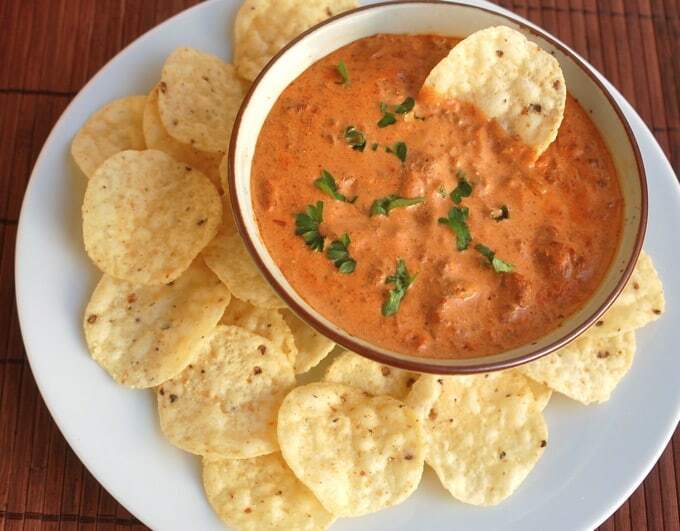 This dip recipe turns out a thin chili cheese dip, not a thick and gloppy one. Source: adapted from Fix-It and Forget-It Lightly Revised and Updated: 600 Healthy, Low-Fat Recipes for Your Slow Cooker (affiliate link) by Phyllis Good. 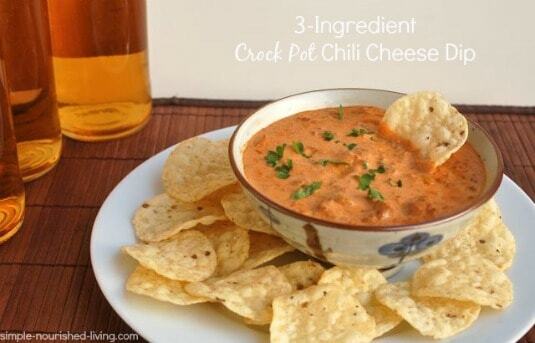 I used to make this dip frequently but in the oven…just layered it in a casserole dish. Never thought about mixing it all together and making it in the crock pot! I haven’t made it in a while, but will keep this in mind. Yes, Kim this is an oldie but goodie. I think my Mom used to make it the way you described.